You are currently browsing the tag archive for the ‘New Jersey’ tag. I’ve been getting ready for a show this Saturday at The Soma Center in Highland Park, NJ, very much in my old stomping grounds near Rutgers University. I really like how Jessica sounds on vocals and viola. I think we have a good combo in sound and personality. This past Friday we played a mini house concert that served as a good dressed rehearsal for this weekend’s show. I didn’t feel quite ready to play one of the songs from the new material I’ve been writing, but I definitely want to get “Everybody Does the Best They Can” on Saturday’s playlist. Songs always feel like works in progress for a while after I start letting them out into the world, anyway. I do think they have to be let out in order to grow into their strongest form. Saturday will be a 2-for-1; after the concert will be Bhakti Dance! – an event I have been creating over the past year in Pennsylvania and in Ohio. I am hoping for a good “hometown” crowd for it this time. All this should feel more or less like part of the usual program; even better in a place where I am most at ease. It is actually a bit more complex at the moment, though thankfully not profoundly so – at least not anymore. 2014 has been a very weird year. I won’t write a book about it here, but suffice it to say that this year I found myself in close proximity with some practices and beliefs that were very off-putting (That would be somewhat of an understatement.). It was being called yoga, and it looked like yoga. I suppose it is yoga of a sort, but not one with which I care to interface. I can’t claim to know the inner life of anyone else, but it seemed to be a yoga of doctrine over discovery. It was clearly of mind over heart – a kind of academic belief in interconnectedness, but profoundly lacking in compassion. I could go on, but there is no need. There has been so much more to the journey than this, but one of the effects of opening my intimate circle to this bizarre detour has been to have to question all, to move through a real, but thankfully temporary fear of yoga and spiritual practice in general. I have had to rediscover for myself what these things are and what parts of them, if any, I want in my life. It has generally not been a good feeling, but it surely is powerful to tear everything down (or to have it torn down) to rebuild what is good and what matters. For a while, I wasn’t sure if I could go back to the part of my world that has been about facilitating kirtan and other yoga-related practices. Thanks to the help of genuine friends and my own journey through these months of decompression, reading, and sorting out what is helpful and for the highest good and what just isn’t, I have been teasing out and rediscovering all the elements of a contemplative, spiritual way of being that do resonate: Balance and integration are everything. Knowing and feeling the value of all beings is truth. The yoga that guides me and that is my daily way is doing the work of growth and finding the perfection in the messiness of real, everyday life, not in the aloof or abstract, but the embodied. Yoga is nothing if not about getting to the heart of love. I am relieved and quietly joyful to get back to my own daily meditation practice and my writing. The concert and Bhakti Dance will be so much fun on Saturday. I am glad to say it will come from a genuine place of opening to joy and enjoyment, finally unafraid. 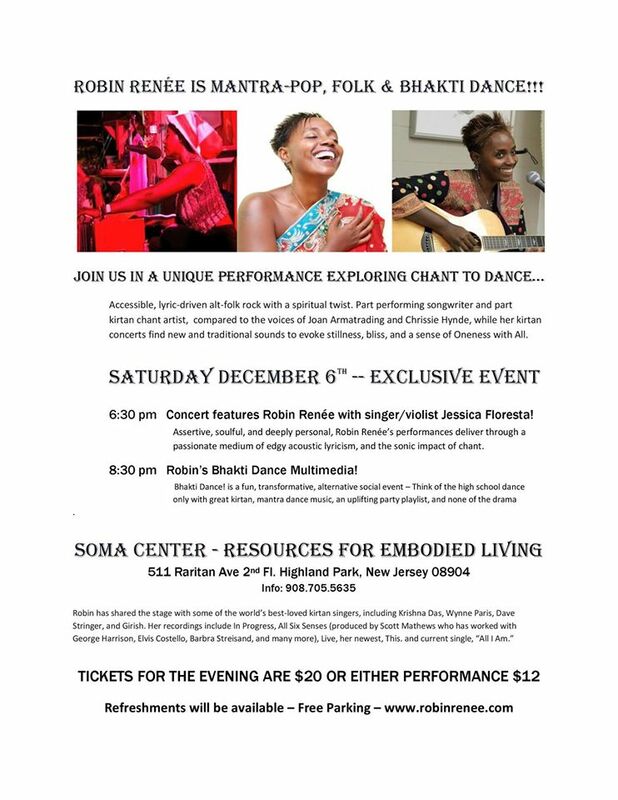 Saturday, December 6th 6:30pm Soma Center *concert and Bhakti Dance! 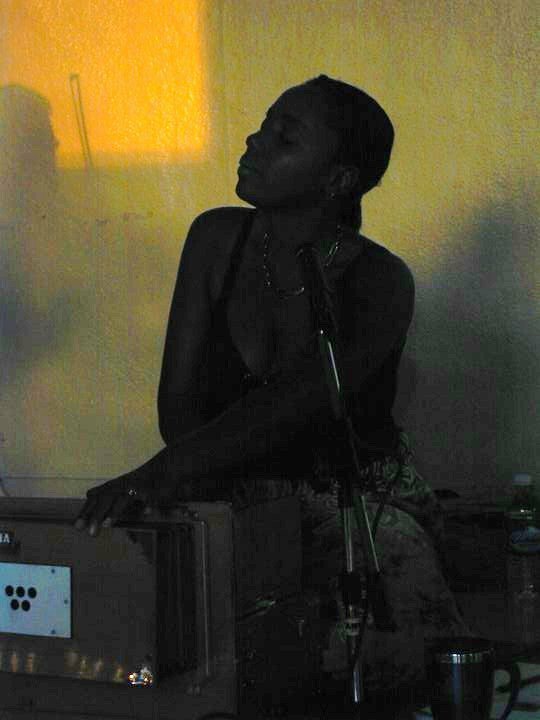 511 Raritan Ave, Highland Park, NJ 08904 732-777-9642 w/ singer/violist Jessica Floresta Concert performance 6:30-8pm Bhakti Dance! 8:30-10pm $12/either event, $20/the evening Bhakti Dance! is a fun, transformative, alternative social event – Think of the high school dance only with great kirtan, mantra dance music, an uplifting party playlist, and none of the drama. Refreshments available.